Four strips of bacon – check. Chives left over from another recipe – got that. 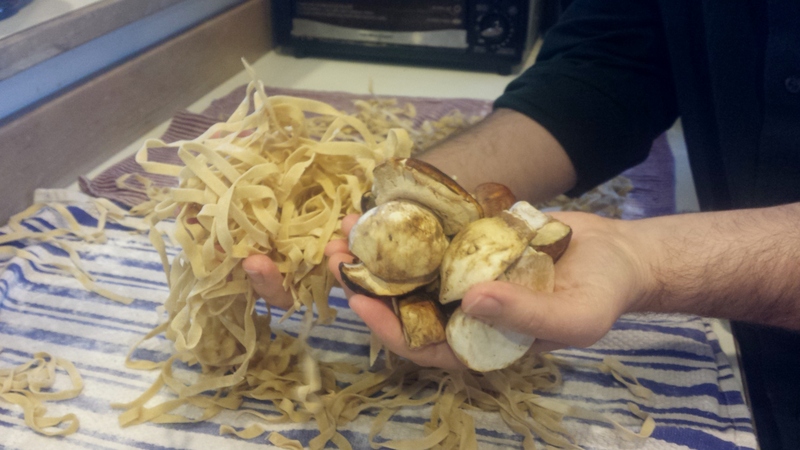 A fist full of homemade tagliatelle thanks to Karla and some fresh porcini mushrooms from Foraged & Found at the Ballard Farmers Market – check and check. Round about a cup of heavy cream and whole milk, mixed together – at the ready. Boiling water, well salted, and a frying pan, hot – both on hand. Add some olive oil to the pan and fry mushrooms with bacon, cut into chunks. Meanwhile, boil the noodles. When ready, add the heavy cream/milk to the frying pan, mix with previous ingredients, heat through. Place noodles in bowls and top with cream sauces, mushrooms, and bacon. Grate some kind of tasty hard Italian cheese on top of that, and, finally, sprinkle with chives, fresh ground pepper, and sea salt. Eat. Enjoy. And, the next time porcini mushrooms are in season, repeat. This entry was posted in Kitchen Notes, Seasonal Cuisine and tagged bacon, farmers market, mushrooms, porcini mushrooms, seasonal ingredients, seattle, tagliatelle. Bookmark the permalink.